A Grand Turk boat cruise at Gibbs Cay. Grand Turk unfortunately doesn’t have the plethora of pristine and uninhabited beach and cay destinations that Providenciales and the Caicos islands have, but a boat cruise is nevertheless a great way to spend the day. French grunt and Squirrelfish on the reef. A boat excursion is an excellent way to experience the pristine water, marine environment, beaches and reefs of Grand Turk. There’s a great variety of vessels to choose from, including sailing yachts, and party watercraft with plenty of space and shade. The vast majority of tourism on Grand Turk revolves around the cruise ships, and consequently the popular boat excursions may get crowded when a cruise ship is in port. 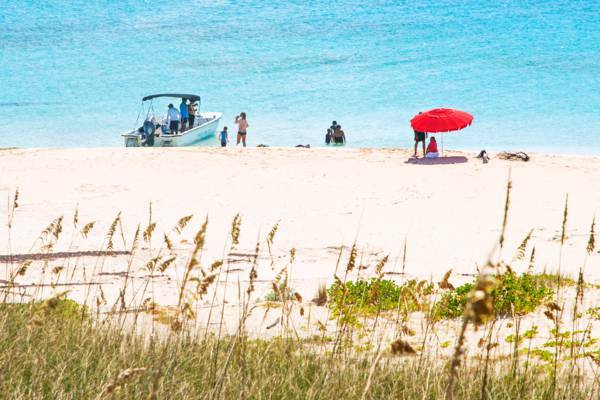 Several of the local boat cruise operators have signed-up to offer bookings through the cruise line, yet the option remains to reserve directly with a local water sports company as well. 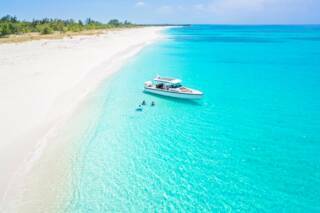 A great aspect of the typical boat excursion is exploring the incredible beaches of the Turks and Caicos. There are so many beautiful and secluded sites, each with perfect turquoise water and soft white sand. Many tours include a beach BBQ, often with drinks and freshly-caught conch. Friendly stingrays at Gibbs Cay. The best snorkelling reefs near Grand Turk can only be reached by boat, so if you’re looking to do some underwater exploring, we definitely recommend that you take one of the dedicated snorkelling boat cruises offered by one of the local dive companies. 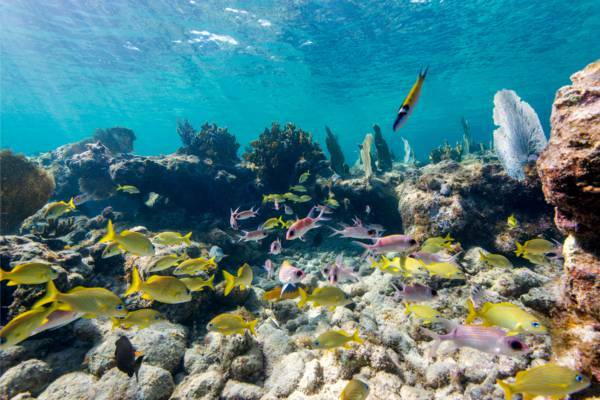 These tours visit the shallow reefs that surround many of the uninhabited islands and cays off Grand Turk. 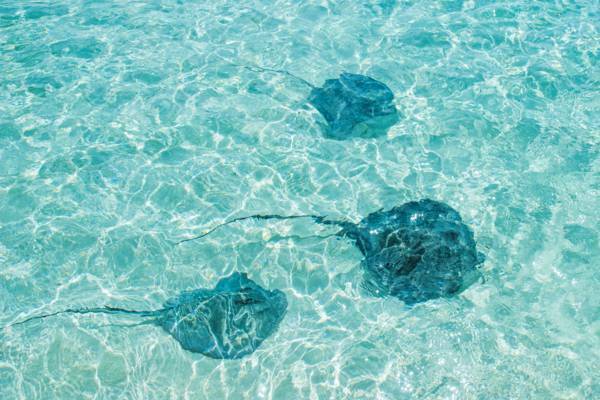 There’s plenty to see as the waters of the Turks and Caicos teem with sea life. Reef fish are everywhere, including angelfish, snappers, groupers, wrasse, blue tangs, French grunts, horse-eye jacks, butterflyfish, damselfish, and triggerfish, as well as the uniquely-shaped trumpetfish and porcupinefish. 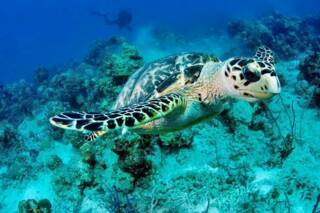 There are also larger sea animals to see – stingrays, eagle rays, small sharks, and turtles. If you get lucky, there may even be a pod of Atlantic bottlenose dolphins! One of the most common marine species in the Turks and Caicos is the parrotfish, and this colourful fish plays a tremendous part in creating and replenishing our spectacular beaches. Almost every reef in the country supports a school of parrotfish, so you’ll be able to see sand creation in action as they scrap algae off the reef and break down old corals. The beach at Gibbs Cay, Turks and Caicos. The little stingray haven of Gibbs Cay is the single most popular destination for cruises departing from Grand Turk, and for good reason. This island is tiny and uninhabited and found a few miles off the east coast of Grand Turk. The cay features an exquisite beach on its west coast, yet this beach isn’t its only claim to fame. When a boat approaches the Gibbs Cay, friendly southern brown stingrays flock to greet the vessel, and freely interact with people. You’ll be able to see and snorkel with the stingrays – an all-too-rare chance to see large marine wildlife close-up in its natural habitat. Most boat excursions to Gibbs Cay also stop at some of the excellent snorkelling sites in the area, so tours to the cay are usually multi-activity and will appeal to all ages. During the January to April winter months, you may be able to have the unforgettable experience of snorkelling with migrating humpback whales. There’s no guarantee of an in-water encounter, yet it will be unforgettable if it does occur. If you’d like the best possible chance of a snorkelling encounter, a private or small group cruise will be the better choice. As is the case with most activities on Grand Turk, cruise ship guests have the option of either booking an activity or adventure as a “shore excursion” through their cruise line, or reserving on their own with a local tour business. As may be expected, it is simpler and easier to book a tour that resold by the cruise line. Due to the higher crowd density, the activities offered through the cruise lines are typically less expensive per-person than if you reserve separately. In either case, local businesses work with ship schedules to get you back in time for your cruise ship departure. If you're arriving by cruise ship, book private tours in advance to ensure a spot. If you're an overnight visitor, you’ll want to work around the cruise schedules for the best experience. Keep in mind that there are relatively few overnight visitors to the island, and boat trip availability may be limited when a cruise ship is in port. Tour groups typically depart from the Grand Turk Cruise Center; either from the shore excursion dock south of the main pier, or from the complex’s front gate, if land transport to another site is necessary. Drinks, refreshments and snacks are complimentary on most boat excursions, as well as land transport if necessary. Shared Cruise… or Private Charter? The beautiful environment at Salt Cay. A private charter is more expensive, yet the trip experience is often much better than on the typical boat tours. The greatest advantage of a private cruise is that you’ll be able to spend your day doing what you’d like, and won’t have to tag along with a huge crowd. The small group size also allows for more time on the water, as the buffer times between tour departures will be less. If you’re looking to bring the per-person excursion rates down a bit, consider arranging the boat tour privately with some fellow cruise guests. 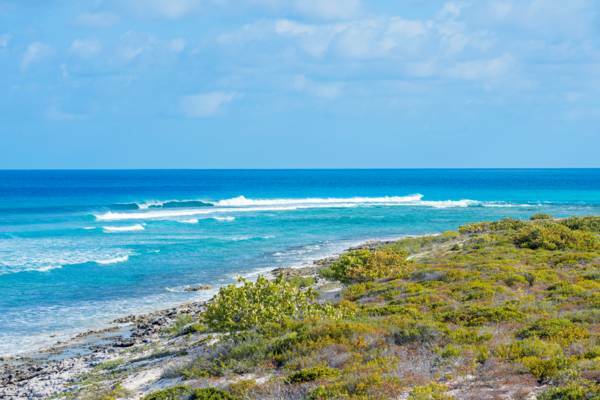 There’s fishing, scuba diving, and snorkelling, yet in our opinion, the most enjoyable activity is exploring the uninhabited and rarely-visited cays between Grand Turk and Salt Cay. Gibbs Cay offers the largest of the beach of these islands, yet attracts the cruise crowds. If you venture a little further, there’s Round Cay, Long Cay, and Cotton Cay, each with their own secluded beach, in addition to several other sand bar shoals. Beachcombing on the tiny cays is often great. You’ll never know what you may find. It may be glass ball floats or antique bottles, seashells, or the classic message in a bottle. Another great place to visit is Salt Cay. This historical island offer colonial buildings, beautiful terrains and coasts, salinas from the old salt industry, and Turks and Caicos donkeys! This tranquil island still exhibits an old Caribbean atmosphere, something that’s difficult to find today.